On Tuesday 10 November, there will be a Day of Action to support the Fight for $15 movement. To educate our membership and interested readers about this struggle and action, UWM AAUP invited a student activist from YES! (Youth Empowered in the Struggle) to write a guest post for our blog. This activist has requested that the post appear without attribution. The Fight for $15 is a movement that has galvanized workers organizing for higher wages and union recognition. The Fight for $15 movement began several years ago by brave McDonald’s workers from New York. These workers demanded higher wages or “livable wages” from the giant multinational. Despite the fact that many of these employees had been working for McDonald’s for years, they still struggled to provide for their families. With the help of organizers and fellow workers, they were able to spark a national and international movement—the Fight for $15. There have been multiple days of action that Fight for $15 workers have organized in the past several years. One of those days of action occurred earlier this year on April 15th, 2015. The Day of Action occurred in many cities throughout the U.S. including here in Milwaukee. Fast food workers and home care workers came out in support of the Fight for $15 movement. The April 15th Day of Action culminated with a rally outside of the UWM Student Union. Students, faculty, staff, and other community members from uwm attended this rally. University faculty and students showed great solidarity for the Fight for $15 movement. The Fight for $15 movement needs educators and students to unite with workers in order for the struggle for higher wages to be palpable. 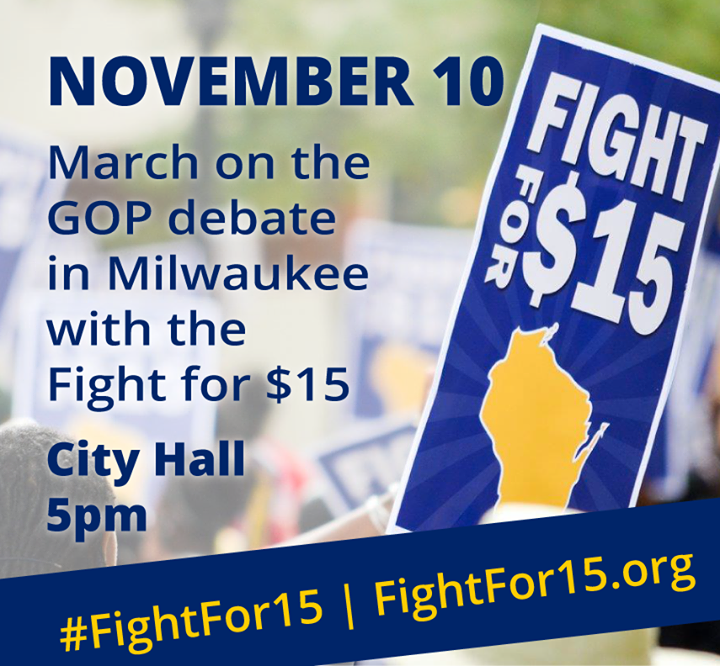 On November 10th, 2015 there will be another Fight for $15 Day of Action in Milwaukee. The Day of Action will include a march from the MATC downtown campus to the Milwaukee City Hall. Now is the time for educators and students to unite with workers. Increasing the wages of fast food workers and other workers will bring positive change to our community. Workers will be able to provide for their families which will help reduce the high poverty rates of Milwaukee. Now is the time to improve our communities. Let’s show these workers that we care about them and about our community.